In the wake of the 2008 financial crisis, big banks paid tens of billions of dollars to settle state and federal fraud investigations, yet not one top bank executive was prosecuted. 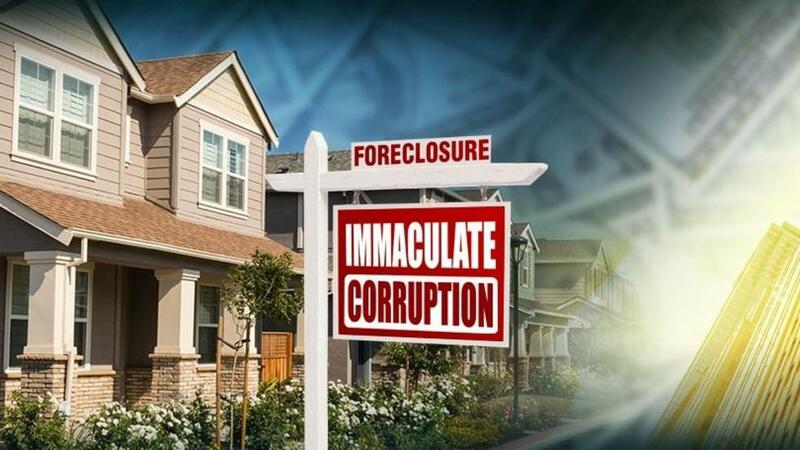 One investigator calls it the "immaculate corruption." But buried in recently unsealed documents is a revelation: major bank executives WERE referred to the Justice Department for possibly violating the law. A key whistleblower, Richard Bowen, is asking why none of them was charged. Richard Bowen knew where the figurative bodies were buried at banking giant Citigroup, once the largest company in the world. Richard Bowen: Over 60% of these mortgages and my largest area, did not meet our guidelines. As a senior vice president, Bowen blew the whistle on Citigroup's practices leading up to the banking crisis; practices like buying and selling risky mortgages and misrepresenting them to the public and investors. Richard Bowen: I started issuing warnings in June of 2006. I sent my warnings um, in a very wide distribution. I made committee presentations. I cornered people in the hallways. Sharyl Attkisson: Executives? High ups? Citigroup played a major role in crashing the U.S. market. It ended up getting a $45 billion taxpayer bailout to survive and eventually paid $7 billion to settle federal and state complaints. But to this day, the Justice Department hasn't charged any top bank executive with a crime. This is the story of how systems intended to hold people accountable failed and Bowen claims seven helped cover for them. Sharyl: Not much has happened in terms of from what I can see to the actual people at Citigroup who were allegedly responsible for this behavior. Richard Bowen: I think that would be very accurate. In 2009 Congress created the Financial Crisis Inquiry Commission. Six members were appointed by Democrats, four by Republicans. Richard Bowen: I witnessed business risk practices which made a mockery of Citi credit policy. Bowen was asked to testify. And he was eager to do it. It was a setting where he says he could publicly tell what he knew, exempt from his Citigroup confidentiality agreement. He wrote up his testimony, naming names and laying blame. But shortly before he testified something mysterious happened. Bowen says he had to cut out eight pages; almost a third of his planned testimony. And almost nobody knew that when he testified on April 7, 2010. Richard Bowen: I warned my business unit management repeatedly during 2006 and 2007 about the risk issues I identified. Sharyl: Did they have you take out names of people responsible? Richard Bowen: Yes, yes. They had originally wanted me to put in the names and the specific instance of cover-ups that I had witnessed. All of that had to be taken out, at least the names. Financial commission staff members who dealt with Bowen say the reason his testimony was shortened is simply because it was too long. They deny suggesting any edits, say there was no attempt to censor or silence Bowen, and say that all acted with the best of intentions and followed the highest ethics. The attorney who represented Bowen told us he agrees Bowen was not censored. But that contradicts what he told the New York Times three years ago when he said, quote, "There's no question that Bowen was censored." And in an email exchange right before Bowen testified, his lawyer said an official on the Financial Commission suggested some substantial changes quote: He thinks that the way its written now, Citi will declare war on both you and the financial commission, and it will primarily consist of an effort to discredit you. The lawyer later added, I get the impression that the revisions are non-negotiable. Bowen, who saved notes, emails and phone call transcripts, claims he was also advised not to discuss certain dealings with then-Citigroup executive and former Treasury Secretary Robert Rubin. And so that information was effectively buried from public view. Also buried were work notes from the financial commission, which it decided to seal in the National Archives for five years. Last March, the financial commission's records were quietly unsealed for the first time. And we were able to obtain copies of Bowen's original testimony. Including parts that were cut. Sharyl: As we look through these documents and we can see what they pulled out, what are some of the more remarkable phrases or sections they took out? Richard Bowen: The entire page talking about the fraudulent representations which were given to the purchasers of mortgage backed securities. That was, I was forced to remove from my written testimony. Sharyl: There's an organizational chart? Richard Bowen: I gave them, at their request, an organization chart that I put together consisting of the layers of management and the names involved of those that were aware of what was going on. He ended up removing that from his public testimony, too. And there's something of a bombshell in the formerly hidden documents. In 2011, when the Financial Commission concluded work, it secretly determined some of the world's largest financial institutions had possibly violated securities law. The Financial Commission privately referred 11 charges against nine executives including Robert Rubin and two other Citigroup officials to Justice Department Attorney General Eric Holder for possible prosecution. Sharyl: The financial inquiry commission had all this information, and then they were tasked with making any criminal referrals to the Department of Justice. Richard Bowen: We now know that the congressional commission sent my criminal referral to the attorney general. In other words, based in part on Bowen's testimony, the financial commission secretly recommended possible charges against top banking officials. But since the records were sealed, the public didn't know it. Now that the documents have finally been released after 5 years, Senator Elizabeth Warren has written the FBI and Justice Department Inspector General asking why nothing came of those criminal charge referrals. "The Department of Justice has not filed any criminal prosecutions against any of the nine individuals, writes Warren. Not one of the nine has gone to prison or been convicted of a criminal offense. Not a single one has even been indicted or brought to trial." Citigroup declined comment. A spokesman for their one-time executive, former Secretary Rubin, told us the Justice Department never interviewed him and he only learned about the possible criminal referrals through media inquiries. The Justice Department and former Attorney General Eric Holder had no comment. In 2013, Holder said this about the big banks. Eric Holder: I am concerned that the size of some of these institutions becomes so large that it does become difficult for us to prosecute them. We did find one staunch defender of the lack of prosecutions:Peter Wallison, a Republican-appointed member of the financial commission or FCIC. Sharyl: Do you feel like those referrals were properly handled based on what we know? There were never any prosecutions of individuals. Peter Wallison: Yes. It's very hard for, prosecutions to occur on a criminal level unless you have the levels of proof that are demanded by the courts and the juries. Wallison has his own take on the financial commission's flaws and has written about them in Hidden in Plain Sight: What Really Caused the World's Worst Financial Crisis and Why It Could Happen Again. He claims Democrats in charge of the financial commission made up their minds from the start to blame everything on the banks not the government. Peter Wallison: It's been cemented into uh the public mind that the big banks on Wall Street were responsible for the financial crisis. And that's wrong. In fact, it was government housing policy that caused the financial crisis and the commission refused to look seriously into that issue. As a former Citigroup executive, Bowen says he remains convinced that bank executives should have paid a price for misrepresentations by their institutions. Sharyl: What's the lesson in all of this? Richard Bowen: If we do not hold people accountable, then we're going to see the same behavior. In the 1980s, and the banking and S&L crisis, we sent over 800 senior bankers to jail. This crisis which is a factor of 70 times worse, I'd say, maybe even greater than that, we have sent no one to jail. And, and I think we basically are saying, there's no downside to doing this. The Democrat-appointed chairman of the Financial Commission, Phil Angelides, told me the big banks used hardball tactics against him and other committee members. Still, he says, the criminal referrals the commission made prove they did their job without fear or favor.